Louisiana State University Press, 9780807126424, 135pp. 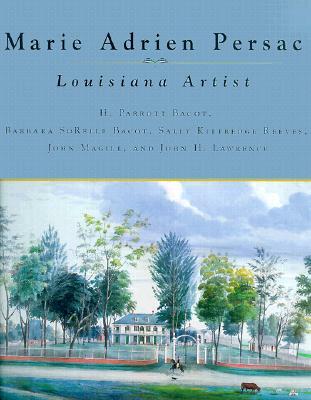 Marie Adrien Persac (1823-1873) was a French-born Louisiana artist who worked in a range of mediums to produce a unique view of the lower Mississippi Valley at midcentury. In the first catalogued exhibition devoted solely to this multifaceted but overlooked talent, paintings, drawings, maps, and photographs from numerous holdings have been brought together to present fresh insights and reevaluate this artist's place in the annals of American history and material culture. Due in part to his broad talents artist, cartographer, architect, civil engineer, photographer, and art teacher Persac's work is of major importance to Southern history researchers and art historians. His paintings of south Louisiana plantation houses have captured that now-varnished lifestyle in minute detail, approximating the exactitude of architectural drafting. Today this series is invaluable to scholars of the period, as is Persac's painting of a steamboat interior -- the only one known to exist -- and another French Opera House, which burned to the ground in 1919. H. Parrott Bacot is professor of art history and formerly executive director of the Museum of Art and Natural Science at Louisiana State University. Barbara SoRelle Bacot is the Senior Architectural Historian in the Division of Historic Preservation of the Louisiana Department of Culture, Recreation, and Tourism. Sally Kittredge Reeves is archivist of the New Orleans Notarial Archives and coauthor of New Orleans Architecture: Volumes IV, V, and VII. John H. Lawrence is director of museum programs at the Historic New Orleans Collection and coauthor of Haunter of Ruins: The Photography of Clarence John Laughlin. John Magill is curator and reading room supervisor at the Collection.